People often confuse palliative care and hospice. Both share the same principles of providing comfort and support for patients with serious illness but there are differences. Palliative Care is care provided to seriously ill patients that aims to improve quality of life, reduce suffering and provide an extra layer of support to the patient and their family from the time of diagnosis. Hospice care is palliative care at the end of life and focuses on a person’s last six months of life or less. When treatment for advanced illness is no longer an option, hospice professionals work to make the patient’s life as comfortable as possible. Palliative care may be provided at any point during a person’s illness, even right from the time of diagnosis. Palliative care is appropriate at any age, at any stage of disease, and along with other types of treatment a patient may be receiving. Consider illnesses like chronic heart or lung disease, HIV/AIDS, multiple sclerosis, the side-effects of chemotherapy. Palliative care aims to make these conditions as manageable as possible so they don’t interfere with the patients’ lives. Palliative care is offered simultaneously with all other appropriate medical treatment to manage the underlying chronic illness from the time of diagnosis. 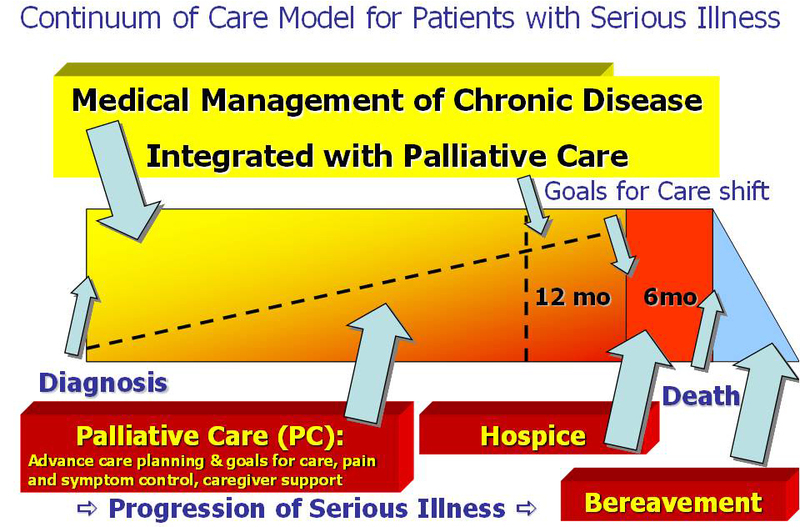 The combination of chronic disease management and palliative care provides the patient with the “best care” blending the art and science of medicine, while also recognizing the limits of medicine. In most cases care is provided in the patient’s home. Hospice care also is provided in homes for the dying (comfort care homes), freestanding hospice centers, hospitals, and nursing homes and other long-term care facilities. Click here for more information on where care is provided. Hospice services are available to patients of any age, religion, race, or illness. Hospice care is covered under Medicare, Medicaid, most private insurance plans, HMOs, and other managed care organizations. Surprisingly, many Medicare beneficiaries are unaware that Medicare’s all-inclusive Hospice Benefit is available to assist dying patients and their families with these issues at the end of life. Hospice care offers a team-oriented approach to medical care, pain management, and emotional and spiritual support tailored to the dying patient’s needs and wishes. For patients who qualify, Medicare will pay for this kind of comprehensive end-of-life care delivered at home or in a hospice facility. The Medicare benefit includes many services not generally covered by Medicare and more than 90 percent of the more than 2,500 hospices in the United States are certified by Medicare. The modern-day American hospice movement began in 1974 with establishment of the Connecticut Hospice in New Haven. It was founded on the model of care best identified with Dame Cicely Saunders, MD, who opened her now-famous Saint Christopher’s Hospice in 1967 in Sydenham, England. Palliative care embraces the hospice philosophy. In 1974, Dr. Balfour Mount, a surgical oncologist at The Royal Victoria Hospital of McGill University in Montreal, Canada, coined the term palliative care to avoid the negative connotations of the word hospice in French culture, and introduced Dr. Saunders’ innovations into academic teaching hospitals. He first demonstrated what it meant to provide holistic care for people with chronic or life-limiting diseases and their families who were experiencing physical, psychological, social, or spiritual distress.